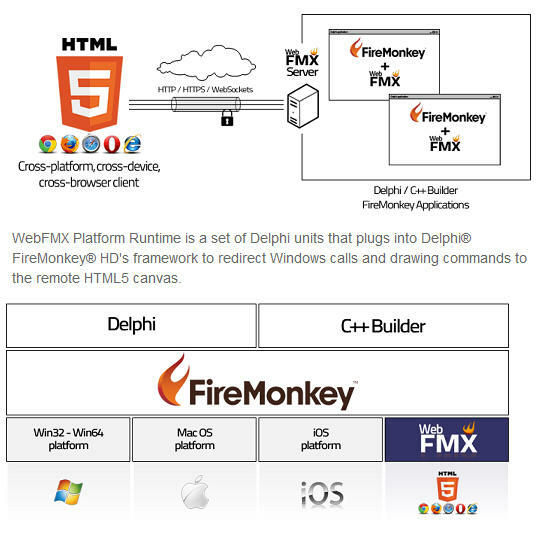 Cybele Software has an interesting component solution which allows you to run Delphi Firemonkey apps in an HTML5 Canvas on any web browser and platform that supports HTML5 Canvas. Basically they provide a set of client components which you place in your Firemonkey app that redirects the drawing of the Firemonkey canvas to a server which then broadcasts it to a HTML5 canvas. I don’t think hardware like a webcam would work and the client app is actually running on your server (like a virtual machine) so the IP address would be of your own server and not of the browser client but other than that it seems like a pretty seemless solution. This compiled with the Mida Converter could really bring your legacy VCL applications straight into the web browser. The price is pretty steep for unlimited users on the server side. Check out all of the product information about the WebFMX solution.